. 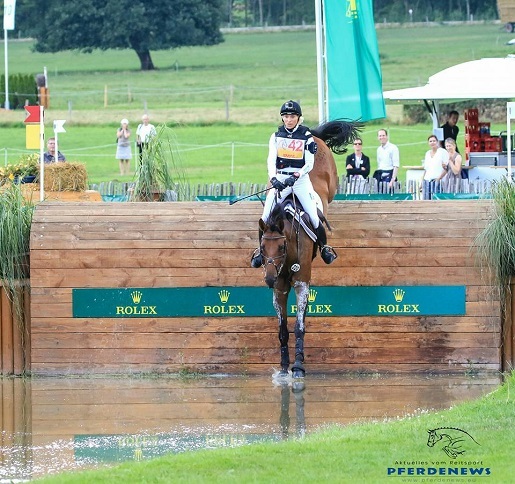 :: DHL Price: Double victory for eventer Ingrid Klimke and victory for the German team ::. It was their Aachen-year: Ingrid Klimke! You won the Aachen DHL Prize, the three-star eventing examination, in the saddle of Escada, she finished second in the saddle of Hale Bob and she won with her team. "I come to the plate!" Beamed raved and cheered Klimke stunned. "On the plate!" Thus says Klimke Aachen panel on which every year the name of the winner will be supplemented. "That was such a kind, running gag 'with us," said the 47-year-old. "I wanted to win here ever again. Last year I have been second, but that it will work this year to coincide with the victory and second place, makes me stunned "With two horses she ended the test with their dressage score, this means:. Both with Escada, as well as with Hale Bob jumped clear in the jumping course and completed the marathon course without obstacles and time faults. An absolute exception performance. "I had two horses on a great feeling," explained Klimke. "It was a dream. Both are fully fit, both have won even four-star tests and were able to complete this three-star price in Aachen, without having to expend. . There were optimal motivation rounds and thus an optimal preparation for the European Championships in four weeks, "Which horse is her favorite for the European Championship in mid-September in Scotland, they would not reveal, laughing:" The question I admit just go to our national coach. "Germany coach Hans Melzer are spoiled for choice, never had so many top riders to choose from as this year and they have been offering first-class round in Aachen's Soers. "Our boys had a little bad luck," said Melzer after DHL price, "but everyone else rode like the devil." The boys' were the first 20-year-old Niklas Bschorer which in England is at home for four years and the first time was in Aachen at the start, and the 22-year-old son of double Olympic champion Hinrich Romeike, Claas Romeike.Both had in the terrain a, Gone Laufer '. For German victorious team included alongside Klimke who had ridden for the team title with Hale Bob, double world champion Sandra Auffarth with her ​​World Cup partner Opgun Louvo, Olympic champion and world champion Michael Jung with scoundrel and Dirk Schrade with Hop and Skip. In the individual ranking Auffarth also occupied third place. Jung was like Klimke with two horses in Aachen at the start, the five seats occupied by the eight-year Takinou and nine with eleven scoundrel. "Aachen was again a super great tournament," said Jung was delighted. "For us that was the best championship preparation, also because we were able to ride the dressage on lawn again -. As it will be in Scotland at the Euro"
In 2006, the German eventing team World Champion in Aachen since they won with one exception every year the Aachen team championship, in 2015 for the eighth time! One day after this eighth victory will nominate the team for the European Championships in September eventing committee of the German Olympic Committee of the cavalry. The second team place in the DHL-Prize was awarded to the rider from New Zealand. With 126.8 points they followed the Germans (120.5 points) and sat down in front of the riders from the USA with 192.9 points. "I was very happy as our riders have mastered the course," smiled team leader Erik Duvander. "And we are very happy with second place." The team of Englishmen who were the winners after Dressage and Jumping still hot on their heels, blurted.The 22-year-old Holly Woodhead, who had ridden with a very good dressage surprisingly on the third place of 42 starters, has overcome an obstacle in the area outside the mark and had to be disqualified. Thus there were only two team riders left and a team classification impossible. Likewise, a lot of praise as for Klimke gave it for the Aachen course designer of the terrain course Rüdiger Schwarz. "Rüdiger is a master at positioning, there is no better! ", For example, praised the two-time Olympic Team Champion Peter Thomsen, who conceded only time error in the terrain with Barny. And Chef d'Equipe Duvander admitted what many riders confirmed: "To be honest, we thought after the departure of the course was a bit easier than in previous years. But we have to let us disabuse. It was a challenge, a real three-star price ". Aachen as a springboard for the European Championship - the optimum test and the optimal result for Ingrid Klimke. "Now I'll only times my entire team a spend!"